Alexei Popyrin's Racquet - What racquet and strings does Popyrin use? 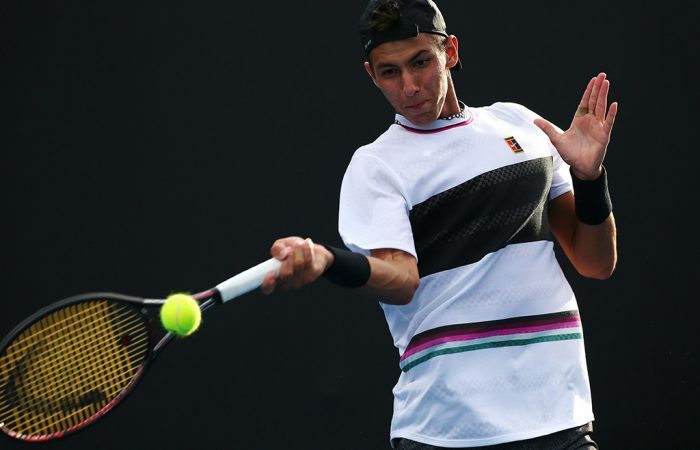 Aussie youngster Alexei Popyrin has just beaten Dominic Thiem in the second round of the Australian Open 2019 and is through to the third round against Lucas Pouille. But what is Alexei Popyrin’s racquet? Alexei Popyrin is just 19 years old but played a stunner of a match against Dominic Thiem that he won by two sets to none when Thiem retired due to injury. Thiem was struggling with an injury but still managed to play okay, however, Popyrin did not give him any respite. 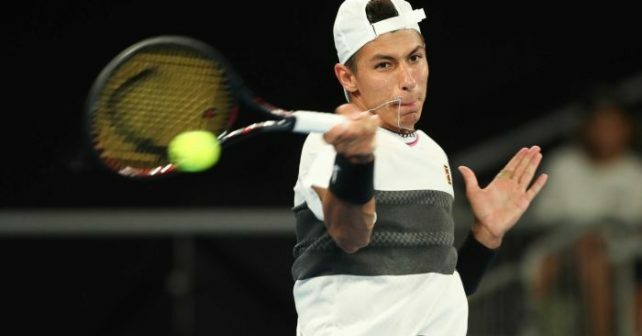 But we are all tennis nerds here and of course wonder: what is Alexei Popyrin’s racquet? Popyrin is using a HEAD PT57A pro stock (other players that use the PT57A: Andy Murray, Gilles Simon, Robin Haase etc). His unstrung specs are (approx): 320 grams with a 32 cm balance. He used to string it with Natural gut mains and Luxilon 4G crosses, but during the Australian Open, he has been using a full bed of Luxilon 4G strung at around 24 kg. * If you want to find out what racquets and strings other ATP players use, you should click here. * Read here for more racquet reviews. I find it impressive how Popyrin can hit so hard and with so much spin using a PT57A, but this just boils down to my own limitations as a tennis player. The PT57A is a control-oriented, flexible, nice feeling racquet, but it is definitely nothing you associate with big swings and the modern game. When you see Tommy Haas or Gilles Simon playing with it, or even Robin Haase, it makes sense, but for a 19-year-old with a big, modern forehand? Well, it just shows how versatile this racquet is and how good Popyrin is at timing the ball! Popyrin lives in Marbella and I have watched him practice up close a couple of times and you don’t need to be a tennis nerd to realize that the guy has huge potential. Wilson tried to get him over to their team for a while, but he has remained loyal to HEAD and the PT57A. That feel is simply hard to beat! The best of luck to Alexei in the rest of the Australian Open and for his career of course! Please check out the Tennisnerd YouTube channel here and Instagram here. Do you know what racket Tiafoe or Cameron Norrie use underneath their current paint jobs? Tiafoe is using a VCORE Duel G 97 and Norrie is using a Pure Control with a Pure Strike VS paint job. Ah the great Pure Control series. I had a Pure Control Tour for a while and loved it so much. The access too power from a players racket was actually nice. That’d be a racket review I would love to watch! How do these young players get introduced to the classic racquets? Really good question. Possibly HEAD gives them a few samples when they try to sign them or they get to borrow a PT57A for example early on. Shame these pro stocks are not commercially available. Thank you, Tennisnerd! And yes, I wholeheartedly agree.